Unaico & SiteTalk Review: Social, MLM &... shares? Unaico & SiteTalk Review: Social, MLM &… shares? As we know it today, social media is huge. Facebook has over five hundred million users and Twitter isn’t too far behind with around two hundred million. With such potential reach and exposure, it isn’t surprising that many seek to duplicate the larger social network’s success. To differentiate themselves though they have to offer more. This might be the combining the network with other things we do online, a closed niche community, or in the case of Unaico’s SiteTalk, a MLM business opportunity. Combining a binary MLM compensation plan, shopping portal, travel, education, pay per click advertising and social network together, SiteTalk aims to carve out its own piece of the social network pie. Today I aim to find out if there’s any value in SiteTalk’s offering. Unaico or SiteTalk – Which one is it? If you’ve conducted some of your own research on either SiteTalk or Unaico, you’ve no doubt come across both company names time and time again. SiteTalk is a listed as a partner of Unaico on their website. Unaico also list ‘adclicks’ (the pay-per-click (PPP) advertising engine found on SiteTalk) as a partner too. Being partner companies only I’m not too entirely sure what Unaico do then. Unaico has a Hong Kong business address whilst SiteTalk has a UK one. Both companies however list Rune Evensen as the CEO/Director respectively. This SiteTalk website lists both Unaico and SiteTalk as companies belonging to the ‘Enigro Group’ (I’m hoping that’s not pronounced the way it’s spelt!). The Enigro group of companies include Unaico, The Oxford Programme, SiteTalk, Realpoker24, and I-investorclub, with several more in development. We (also) have joint ventures with companies in nutrition, property, telecoms, marketing and sales in a multitude of niche markets. All operating under the umbrella of Enigro Group and founder Jarle Thorsen, Unaico and SiteTalk merely appear to be smaller properties operating within a larger business group. The companies Enigro Group own and have joint ventures with are no doubt where the bulk of the offers, products and services available on SiteTalk are sourced from. Thus Enigro Group not only make their money off your activity on their SiteTalk network, but also directly off you should you choose to participate in the SiteTalk MLM business opportunity. SiteTalk itself is a social network and as such directly doesn’t offer and products or services beyond the network itself. As a member of SiteTalk however you are given access to a variety of third party (but still owned or joint ventured by parent company Enigro) products and services. 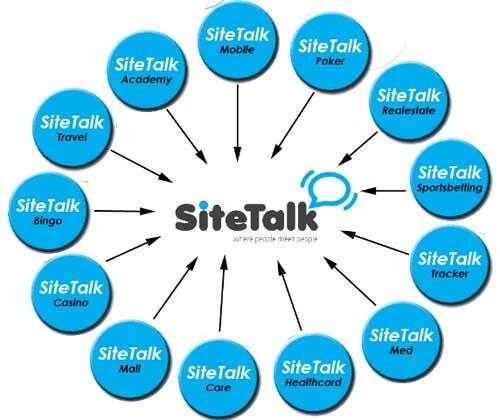 As you can see, the scope of SiteTalk’s services are quite impressive ranging from ‘casino’ to ‘travel’ to the vague ‘med’. SiteTalk acknowledge that not all of these services are currently available and seemingly they are working on introducing what isn’t available in the near future. Most likely pending the success (or failure) of the SiteTalk network itself. SiteTalk utilises a binary MLM compensation plan which essentially means your downline is split into two arms underneath you. Each of these two arms then splits into two and so on and so forth unlimited levels deep. Along with the binary compensation plan, commissions in SiteTalk revolve around what is called ‘Business Volume’ (BV). In a nutshell, each product sold via the SiteTalk Mall generates a certain level of BV. To get an idea of how much BV you can earn, the SiteTalk Mall website has a browsable online mall listing the current catalogue and corresponding awarded BV. One example is the Samsung LE40C750 3D television which SiteTalk’s mall has for sale (well, it’s out of stock) at $1,730 USD equating to 97 BV. You can browse around the rest of the categories to see the BV values of SiteTalk Mall’s other products. Note that 1 BV is equal to 1 EUR and commissions wise you’re usually paid out a percentage of this rather than the whole BV amount. Combining the BV model and their MLM binary compensation plan, SiteTalk offer their members three types of commission payouts. The Direct Personal Sales Commission is a 10% commission paid out directly based on the BV value of products purchased via ‘all personally generated sales‘ through your ‘memberMall’. Using the Samsung TV example above, if you sold one through your memberMall, you’d generate 97 BV, of which you’d get a 9.7 BV commission. This translates into a discount of 9.7 EUR, or $14 USD. The second type of commissions offered by SiteTalk revolves around the binary compensation plan and as mentioned before, your downline (people you recruit to the SiteTalk business opportunity) are split into two arms. You can choose who goes where on these two arms but be aware that this can and will affect your commission payout. Utilising ‘group business volume’ (GBV) the binary plan commission offered by SiteTalk revolves around weekly generated GBV. The idea is that each week both arms of your binary team will generate GBV. At the end of the week this GBV is tallied up on either side and you are paid out 10% on your weaker arm. For example, one side of your binary team make 5000 BV whilst the other 6000 BV. Your weekly commission is 10% of 5000 which is 500BV. This equates to 500 EUR ($722 USD). Additionally, the value of your lower arm’s BV is then subtracted from your stronger arm. In the above example this means that after the commission is paid out, your stronger arm’s BV value would be less 5000 which means it drops to 1000. So you’re starting BV for the following week would be 0/1000. Note that BV automatically expires after three months if it is not utilised via a commission payout. This could be problematic if you had one very strong binary arm and one very weak one. The Binary Matching bonus is paid out up to seven levels deep in your binary team and ranges from a 2-5% payout of all BV commissions earned by those under you. The percentage of the commission paid out and number of levels your able to claim it on is directly correlates to the amount of people you bring to the SiteTalk business. If you personally sponsor 2 Bronze/Gold members (one left and one right on your binary team), you qualify to claim the matching bonus 4 levels deep. If you personally sponsor 4 Bronze/Gold members (a minimum of one in each binary arm), you qualify to claim the matching bonus 5 levels deep. If you personally sponsor 6 Bronze/Gold members (a minimum of one in each binary arm), you qualify to claim the matching bonus 6 levels deep. If you personally sponsor 10 Bronze/Gold members (a minimum of one in each binary arm), you qualify to claim the matching bonus 7 levels deep. One interesting component of SiteTalk and Unaico is the ability for its members to trade virtual shares. In essence, members are able to trade virtual shares amongst eachother in an internal stock exchange style marketplace. The price of the shares is hedged to the overall success of SiteTalk and Unaico themselves but is also able to be influenced by the speculation of the company’s members. As this is going on the price is also driven down by the dilution of the share price by new members (new Bronze and Gold members are awarded a fixed price share virtual share portfolio in the company reducing the overall share price as total share numbers increase). Letting members from all over the world trade in virtual stocks with no external value pegged to them sounds kind of dodgy, but I’m no financial advisor or legal expert in this area. As someone looking at the business opportunity of Unaico and SiteTalk though, I can say that without further clarification, letting your members internally trade virtual shares and speculate on the value of a company they have a direct vested interest sets off my alarm bells. Hats off to Enigro and Jarle Thorsen for bringing something a bit different to the MLM business opportunity though. Membership to Unaico is handled through SiteTalk which is the public face of the greater Enigro Group. Being a social network site, SiteTalk is free for anyone to join up but if you want to participate in their internal share market you need to pay for a Bronze or Gold membership (or earn it out of your SiteTalk commissions, but either way you still end up paying for it). In addition to the internal stock market, Bronze and Gold members are given e-books (the details of which I have no idea and are not listed), fixed credits to use on the ‘Ad-clicks’ pay per click advertising network (which appears to be unique and only operating on the SiteTalk social network), a fixed value amount of virtual shares in SiteTalk/Unaico and most important of all different maximum commission earnings per week. Yes, you need to pay Unaico/SiteTalk if you want to increase the weekly commission cap you can earn. Free User – Membership at the Free User level is free but restricts SiteTalk members to only earning 5% in Direct Personal Sales Commissions. Free Users are not given access to the binary compensation plan. Member – A Member receives 10% in Direct Personal Sales Commissions and qualifies to participate in the binary compensation plan (including all plan bonuses). Entry at the Member level will cost you 149 EUR ($215 USD) and you are restricted to earning 500 EUR a week ($722 USD). Bronze Membership will cost you 500 EUR ($722 USD) and increases your weekly earnings cap to 2,500 EUR ($3610 USD). Gold membership also increases your maximum weekly earnings to 12,500 EUR a week ($18000 USD) but costs 2,000 EUR ($2888 USD) to join. The main problem I see it with Unaico/SiteTalk’s business model of combining all these additional features with a social network is that the people using the network are in it for the money, as opposed to socially connected with eachother. The reason Facebook and Twitter are so popular is that it’s the social factor behind them driving the growth and sustainability of the userbase. If all it took was to add a shopping mall and some affiliate deals to the networks to bring in large amounts of revenue, don’t you think either would have done so by now? In trying to combine ‘everything we already do online‘ into one portal, SiteTalk becomes less effective at servicing each of those needs. Take their shopping mall for example, a quick browse reveals quite a small inventory size which is blatantly obvious when you start looking at high ticket items. More often than not you’ve got only item to choose from and let’s face it, when compared to proper shopping online shopping malls who offer you dozens of choices and pricepoints, the only people that are going to be using SiteTalk’s mall are those vested in the business opportunity. A whole bunch of people interested in a business opportunity does not a successful social network make. And without that, we’re missing a key component of what makes the current leaders in social networks so successful today. The social aspect of it all. Sure, you can refer your friends and family to SiteTalk so that you’ve got someone to socially interact with, but outside of the business opportunity, why would you? Facebook already does a good enough job of that and already has a simply massive userbase to connect with. Are people really going to leave Facebook et al. in droves simply for the opportunity to decrease the effectiveness with which they can shop online amongst all the other services currently offered or promised by SiteTalk? The weaknesses of SiteTalk are the offering of virtual shares, the fact that you need to pay SiteTalk to earn more in commissions, and the requirement to recruit people to SiteTalk to earn the matching bonus (and the fact that they can’t be free members). Meanwhile the strengths aer solely grounded in the social network which, as outlined above is always going to suffer from the stigma of being solely populated by those merely interested in the business opportunity – rather than genuinely wishing to connect with people. Would you browse over to a social network if you were wanting to buy something you wanted online? Without sales there’s no BV and therefore no commissions; making SiteTalk and Unaico I believe, to be an incredibly hard MLM business opportunity to be successful in. This answer is mostly based on “rumours”, “opinions” and other unreliable sources. It is partly based on comparison to other business projects (stockmarkets, shops, gambling sites, social communities – and former pyramid schemes). You should never consider this answer to be some kind of “expert review”, “expert opinion” or “qualified opinion”. Their foundes are from Norway and Sweden, “friends in business” from former pyramid schemes (T5PC The five percent community, WGI World Games Inc., World Wide Alliance, and so on). I’m not familiar with any of these former concepts, I just listed them as “possible background”. In June 2009 the Norwegian Gaming Board published a warning against Enigro, as a possible pyramid scheme. Since then they haven’t been very active in Norway, meaning it’s difficult to investigate them in Norway. I usually collect a lot of infomation from ordinary members, but so far I have only found members that tries to recruit me (they only offer misleading information). As far as I can see they’re shortlived in each and every country – something like a “marketing campaign” (grow rapidly, but don’t invest more money when the recruitment slows down – move on to another market). Currently they seems to be most active in Russia, Bangladesh and Pakistan, while they have slowed down in Sweden, parts of Eastern Europe, Germany, some parts of Asia. “Shortlived” doesn’t mean they collapse or dissolves, it means that they only have very reduced activity. It doesn’t “feel” like a real social community – if you know what I mean. Real social communities have different kinds of members with a wider range of interests. The website is real, of course, but I don’t believe this is a real business. Real business needs an organization – employers who do all the work that generates income. They need far more than a website, and a few people handling orders and delivery. This website “feels like” it is set up to “look like the real thing”, but it doesn’t feel like the real thing. They have a facade that looks real, but they don’t have the organization needed for big scale trade. Distribution of goods is quite labour-intenzive in the real world. This applies even if you don’t handle the distribution yourself, if you only act as a “middleman”. Of couse this is a real website (I haven’t seen it yet). I didn’t find any “matching members” – the people that are dedicated to playing poker. Most of the members are income opportunity seekers. Of course some of them will be interested in poker and casino, but they are not real gamblers. They have the site and the service here, but they don’t have the right type of members. Virtual shares will only be worth something in your imagination. They are possible to sell to others if they share the same imagination, but they have no real value outside people’s imagination. You can make real money on them for a short amount of time. Experienced networkers use these more like a “working tool” than an investment. They “invests” to get higher commission payouts. They sell some of the shares to new members in their downline – recovering their original investment, and if possible make some money. They usually lose parts of their “investment”, they too – when the market collapse. They only lose virtual money if they’re experienced. Imagine selling virtual shares when nobody’s interested in buying them? They have no real value outside people’s imagination. You don’t own a part of any company either, the shares are only “tickets” in a game. I consider these shares and similar “investments” to be their main source of income. You don’t need a big organization to distribute virtual money among members. A “system” will do most of the work for you. This means that it’s probably some sort of Ponzi scheme – “robbin’ Joe to pay Paul”. They are mostly in Norwegian and Swedish, and are mostly more than 6 months old. I will post a few sources when (and if) I find them. Niche communities are worthless. People join Facebook to find people ALREADY on. It’s a snowball. Why would any one join this at all? Certainly not for the alleged “deals” or commission. I get better selection and probably better commission through Amazon Associates. And how exactly do you sell the stuff? What exactly do you tell people you want to recruit? That “we offer everything under the sun… Well, some of it”? Try to google and compare? I’ll guess they have a lot of imaginary members in Sitetalk? A memberlist was released on 4shared.com in early February 2011 – “Sitetalk public profile information.pdf”. It’s a 256 pages pdf. It appears to be a real memberlist, but I’m not sure if this was an updated list (in February) or an old one. I don’t consider this list to be of “public interest”. Those who are interested will probably find it themselves. * 1 or 2 members in 60-70 of the countries (looks like “let’s add some members there, too” – using the list “Coutries in the world”). * Wales and Scotland counted as separate countries, with 1 member each. We normally include them in United Kingdom. Pages upon pages with what appears to be inactive members or something – registered as “UNxxxxxxx” (UN91632 to UN101517) – page 158. I don’t believe in any of their claims. They now claim to have 1 or 2 million members, as far as I know. The top three countries traffic wise at this time are Bangladesh, Slovenia and Pakistan. You can see Alexa’s full report on SiteTalk here. The problem is all three countries have minimal law on MLM or its legality. TVI Express is also hot in Bangladesh and was hot in Slovenia (until it got kicked out of nearby Tajikstan, Czech Republic, Georgia, and Hungary). Popularity doesn’t mean much though. I’ve had a moron trying to convince me that TVI Express must be good because it ranked high at mlmrankings.com He claimed it ranked #11. When I got there it’s ranked #69. What a joke. TVI Express in Slovenia? Never heard of this TVI Express, but Sitetalk really was kind of big. And legislature really is kind of loose (but in Slovenia they were the first that officially warned against Uniaco). I think that soft legislature is the reason that even criminal police and media are (still) kind of cautious with their warnings. They (most of them) don’t say Sitetalk or Uniaco, thay just say: beware of investing into social media that wants you to pay 2000 or 500 euros. Kind of sad. As I can see, the top three countries are Bangladesh, Russia and Pakistan. Now. … but otherwise I agree with your comments, authors conclusions and I did like this whole post. “Most popular in …” doesn’t mean “big in …”. 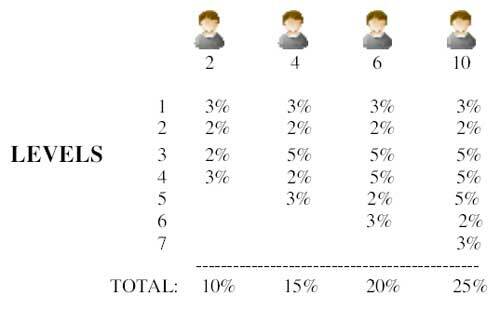 I am most popular in Norway (I know at least 2 people who likes me there). Alexa and other webtools surely shows that they’re growing, but they only have 30,000 unique visitors per month. BehindMLM have 4,900 unique visitors, and he don’t PAY any of them to visit his site. Generally speaking, it isn’t a good idea to pay people for visiting a website (except as a bait on a gambling-site or something similar). a. Connect to experienced networkers in a country, as local leaders who knows the language and culture – and have the connections needed. b. Some sort of marketing efforts that make them look BIG and successful. It doesn’t have to be an expensive campaign, but it have to look like a big company campaign. It only have to look expensive. c. “Hallelujah-meetings” to recruit people. The recruitment then slows down. The effect of a hallelujah-meeting doesn’t last very long. People get back to reality within a few weeks. NOTE: The disclaimer in post 1 still applies. “Rumours”, “guessing”, “unreliable sources”. I am not very familiar with this company, and I’m not an “expert” either. visitors by Country for Sitetalk.com – the first three leading by percents of Site Traffic are Bangladesh, Russia and Pakistan. But the top three countries traffic wise really are Bangladesh, Slovenia and Pakistan. I have heard that the founders of unaico and sitetalk are just for a fast cash, not somuch for a long term business, thats why you see where its popularity is greatest. They just want to build a large userbase and sell the company perhaps for a few billion, the owners keep 51% of the shares. Here is the the best mlm company now on the net, Spinglo. Synkronice, the owner of spinglo is a serious company, they have a brilliant website concept coming soon, and they have the most generous payment and bonus plan perhaps ever. Unfortunately, both positive rumors and negative rumors proliferate on the Internet, often spread by competitors. Thus, it must be said AGAIN: find the FACTS. Spinglo seems to be a shopping portal on the surface. I’ve added it to the list for a writeup. offers promoted by I-investorclub Ltd.
UK WG1 9QR) offers investment services. The company also offers services from a website http://www.iinvestorclub. agreements with or transfer assets to I-investorclub Ltd. This was from summer 2010 I believe. It was also in the news. Most of my material is at least 6 months old. One of our main investments is now Naturemed AS, The health product company that we joined in and started last fall with a few other partners. As we have written before the company has a very good product, called Bijoga, which helps with problems with specially Diabetes 2. We are now working on further developments of the products and negotiating distribution deals all over the world. We are following up and the funds that I-investorclub Ltd invested in the company are well taken care of from the board of directors where I-investorclub also is represented. I-investorclub is running the share offering for Naturemed AS in addition to other activities around the company. We believe in a tremendous value increase in the months to come. We are also, satisfied with the developments in Stolz Technology AS. In Stolz we have had live events lately and our system is well accepted by the using public. The future looks very good for the moment and everything is going according to our plans with the company. On the other projects we are more financial investors. There we are following up our investments and letting our project management run the businesses. Naturemed AS is an “empty” company with no activity, registered in late 2009 with $25,500 in shares, no further investments. It pretended to be active in 3 months around January 2010. According to company-register in Norway, and to purehelp.no (company info). Stoltz Technology AS is a “special case”, meaning that I don’t know their exact role in this. I will guess some kind of “money laundering” or something. They seem to have 1 product and 1 minor customer. Sharecapital have increased from $1M to $10M in the last years (in list of unregistered stocks, but not confirmed anywhere else). Parts of 2 or more “opinions” combined may actually describe something close to a fact – like eplaining why the pagerank has very few unique visitors. The pagerank is actually “FAKE”, they don’t have the number of members they pretend to have. They use fake activity from members to generate pagerank. They also seems to have A LOT of fake members. I’ll guess their actual number of members are closer to 10,000 than to 2 million. They have at least 2 or 3 links to BehindMLM (this article, or the comments). We also share the same memberlist (from 4shared.com, february 5 2011). We should avoid or be careful using each other as “reliable sources” on anything. They seem to “pay” members to be active? * To activate you have to pay for it, any of the “packages” (€149 to €2,000). Only an active member can withdraw real money. * You can even buy multiple “packages”, and I’ll guess this also means that you can have multiple userprofiles, too? Someone stated to have bought 10 “Gold packages”. * As an active member, you have to log in at least 3 times a week and do some activity. This activity generates a higher pagerank and increase the value of the shares (in theory). “The more activity you create, the more your ‘options’ will be worth after a while”. * As an active member you can withdraw BV as real money. Free members can only spend their BV inside Sitetalk. And some of the ‘higher’ ranked members are even promised some money for active memebers that are signed under them (meaning that: if you have 3000 active members (who are clicking around sitetalk as mad) on your weakest ‘leg’ (this means that there has to be over 6000 people signed under you), you could get 300 euros per week). March 8 2011 – Gryphon (“options, not shares”). Explaining why he means this is legal. You dont have to CLICK ClICK CLICK CLICK to be active. For being active you just have to login at least 3 times a week, shout a message your friends. thats all . As long as you friends are active you are gonna get money every week. Why would anyone want to pay for this kind of “fake activity”, like buying the company for some billions? This activity will never generate any income? This means that your ‘options’ is actually worthless, or at least close to worthless in a market. Such fake activity usually decreases a company’s worth instead of increasing it. It IS actually some valuable information there, but you have to ‘extract and combine’ to get any use of most of it. I have only skimmed through the thread, not reading every post. I remember Ted because as far as I know, he’s the only one who had an expose site DDOS-bombed by TVI Express (or any other scam). Your analysis was thorogh and not opinionated. It exposied site talk for what it is by detailing the underying concept of this MLM scam and made it possible how very difficult to see how to make money with this business, as opposed to the presentation given on site talk behalf eveyone below you eventually suffers and ultimately looses. I understand and I do agree. * AdClicks is used to BUY more members into your downline, at a price of 2,000 AdClicks for each new member. 2,000 AdClicks equals €100. So far the turnover seems to have been substantially generated by sales of the various packages. In the back office it also becomes clear what the OFCs and AdClicks are all about. If new community members register directly via SiteTalk, they aren´t allocated to a sponsor (or what they call a referrer). These members without referrers are distributed to the owners of the Bronze and Gold Packages for 2,000 AdClicks. That means that the Bronze Member gets five people in his downline for his 10,000 AdClicks and a Gold Member gets 20 newly registered SiteTalk users. So what happens when somebody wants to register completely free of charge and doesn´t want to go into business at all? After all everything is free of charge and without obligation. Nevertheless, suddenly you have a referrer who only wants the best – namely our money. It´s clear that contact will be made and an attempt will be made to sell at least a Bronze Package. So much for registration free of charge and use completely without obligation. unaico server load problem should b solved quickly…. Thanks to Unaico/sitetalk & above all who have commented. From these anybody can clearly know about unaico/sitetalk business opportunity. So all are requested to read these. I feel proud to be a part of this. When going in Syock Exchange Unacio? As far as I know, Unaico/SiteTalk will NEVER be registered on an ordinary stock exchange. Price of 1 OFC = 0 in the real world (outside Unaico). If you can’t sell them in their internal ‘stock exchange’ then you probably have lost your money. I want to know where is your Site or Unico company address and head office both in Singapore and Hong Kong. I don’t think they have any real office, except for maybe some temporarily solutions. Unaico was more like an “investor scam” or “Ponzi scheme” than a real business, when I checked it more than a year ago. If you’re able to find any address, you will probably find out that the address belongs to some “virtual office company”, “business formations agent” or something similar. The company names in India quoted earlier seems to be fake, but I have found a registered UNAICO company in the MCA-registry. SiteTalk has resurfaced – partnering with a new shopping portal at millioo.com (to be launched tomorrow, Sunday 19 May 2013)! I’ll upload a screenshot of this page showing the identical SiteTalk logo as shown above if someone tells me how. You can use the “Contact” button to send e-mail directly to Oz (the owner here). UNAICO / SiteTalk have mostly been active in Eastern Europe and in Asia (Bangladesh, Pakistan among other countries), so we don’t have much information about it since 2010 or 2011. It seems that the people behind Unaico/SiteTalk are back and are about to become active in the UK (they are hosting a launch event for millioo.com at a hotel near Heathrow airport tommorow). I’m currently posting in this site’s Enwire/Spinglo thread highlighting the connections I’ve found between Unaico/SiteTalk and Enwire/Trig (Trig is the relaunched Spinglo). Anyone interested in Unaico/SiteTalk should follow those comments too. SiteTalk Unaoco is now SiteTalk millioo, They are surviving in India with new plans and vision. But registration with MCA remains same as UNAICO HOLDING INDIA PRIVATE LIMITED. But bank account with Standard Chartered is with SiteTalk Services India Pvt Ltd.
SiteTalk Unaoco is now SiteTalk millioo, They are surviving in India with new plans and vision. The registered company in India is actually a local branch, not the main company itself. They registered local companies in the markets they planned to enter, but they originated out of Norway and Sweden (UNAICO = United Nordic Alliance something). SiteTalk (the member base) was sold to Enwire AB / Cellpoint Connect AB in Sweden in early 2013, as an “Exit strategy” to fool the investors who had bought pre-ipo shares in the company. UNAICO / SiteTalk / Enigro / I-InvestorClub were all banned in Norway already in June 2010 or earlier, banned in Sweden, banned in Slovenia or Hungary around the same time. UNAICO is now called OPN (The Opportunity Network). Enwire is joining forces with OPN/Sitetalk, bringing in 4 million of their users (That is what uplines were told to tell their downlines). How accurate/true this is beyond me. Jan Eric Nyman & Jonas Werner joined OPN/Sitetalk! In other words retail failed so now they’re going to force affiliates to pay into the system? Int_EU: Enwire is joining forces with OPN/Sitetalk, bringing in 4 million of their users (That is what uplines were told to tell their downlines). It didn’t generate any revenue for Trig.com (April to July 2013), but that user base was used to pump up the share prices for Cellpoint Connect AB (ticker CPNT) in May 2013. Trig.com was sold from Cellpoint Connect AB to another empty company a few months ago. I can probably find some information about it in Swedish investor forums (e.g. Avanza forum), and in CPNT’s biannual report (January to June 2013, can be found on “Aktietorget.se”). I believe both UNAICO and Synkronice have ceased to exist / have been sold to others. UNAICO was active in Bangladesh in 2011, the last time I checked it. I have read something about an IPO (Initial Public Offering, “going public”) that failed / was rejected by a stock exchange around January 2013. I believe it was sold to Enwire AB after that. The information posted here are partly from poor quality sources, e.g. investor forums in Sweden and Norway. They’re typically “rumour mills”. But I have actually checked CPNT using some official sources. @ Oz; Yes, a person who wants to earn & get paid, has to spend minimum EUR 69 per month to maintain “Active Status”. Now if you have 100 victims on Auto-Shipment (Level 5) in your lesser leg, you qualify for BMW 3 for a period of 28 days. If you qualify for 6 successive periods (6 months), then you will get a new (BMW) car [covered by SiteTalk insignia] with Swedish plates e.g. “OPN 009”. Downlines were told “The only expense you’ll have is the gas, everything else is taken care of … [by the company]”. As for SiteTalk share options, they are now on Cyprus Stock Exchange. Hope this helps on what has already been revealed & explained with some additional info. Oh dear, Frank Ricketts calls “the bloggers” and those who do their due diligence (“the Googlers”), idiots. Yet in the same breath he admits SiteTalk management and affiliates have “made mistakes” as recently as two weeks ago. According to Ricketts making mistakes is alright but calling said mistakes out and expecting accountability? Not so much. He then derails his own speech by threatening to sue “the bloggers” who are reporting it. Regarding the stock exchange, so Britain knocks them back and they apply in Cyprus as a fall-back. Definitely one of the more bizarre MLM CEO addresses I’ve seen. The video was uploaded six months ago and in it Ricketts vows that they will get British GXG listing. British regulators however had other ideas. I am happy confirm that Sitetalk has not even applied to join GXG let alone been approved to join the market and is categorically not listing on the 14th. I have already been made aware about individuals behind this company. ST Communities is a cash shell that is indeed on GXG Markets however there is no way that the gentlemen in question would pass our screening process to be directors or controlling shareholders of a company on GXG should they attempt a reverse takeover. General Rules of the Market (Rule 1.1) and the Disclosure Requirements (Rule 5.2). ST Communities Ltd (the Company) has today been served with a termination notice from GXG Markets A/S in relation to the trading of the Company’s shares on GXG First Quote. The termination notice was issued as a result of a significant breach of both the General Rules of the Market (Rule 1.1) and the Disclosure Requirements (Rule 5.2). The company has 10 days to appeal against this decision. Should any appeal be unsuccessful, the Company will have its market quotation on GXG First Quote terminated at the close of business on Friday 15th February 2013. In the meantime the suspension of trading in the Company’s shares will remain in force. Dunno if the appeal was filed or not but if so it appears to have failed. Now getting listed on the Cyprus stock exchange counts for what exactly? Not only did the London GXG exchange reject them, they pretty much laid out their disapproval point-blank. All I’m seeing is a listing on an exchange that is obviously less stringent than the GXG. Sitetalk shares appear to have begun trading under “Global Digital Services PLC” on the 19th of August at 0.012, now trading at 0.02. Is there any reason they have to keep using shell companies to float themselves? SiteTalk doesn’t generate any profit, other than the investments from the members themselves being distributed around in the system from bottom to top. Its member base is rather worthless in itself. It can only be used in investment frauds or be sold to other network marketing companies. It WAS used to pump up CPNT’s share price in May 2013. I watched it too, so now it has 292 views (4 in this week). He didn’t conclude about the problem and mistakes, but generally it seems to be a problem having 100,000 share holders without having the formalities in place first? The virtual share system can’t easily be converted into real shares without paying in money, AFTER the PRE-IPO shares have been registered? The Cyprus Stock Exchange didn’t tell us much, other than that a company named Global Digital Services Plc has been listed there? It didn’t show much information at all, e.g. about share holders. 52 week high was €0.20 per share 1/16 (6.25%) of the estimated price in the prospect. Nominal share value was set to €0.12 = 3.75% of the value in the internal market. So the investors have basically lost more than 90% of the investments (93.75% – 96.25%), if I have interpreted it correctly? That didn’t come as a surprise. 34,795 shares * €0.01 = €347.95 “fully paid in”. Does that mean that the internal market options (valued at €3.20) converted to €0.01 each in another company than SiteTalk Holding? That will be 99.6875% loss from the virtual market to the real one. I have tried to interpret it as best as I can, based on the information available. The share HAS BEEN traded in the first 2 weeks in very small volumes, probably in an attempt to pump up the price. But after that the trade went completely dead. That’s why it was difficult to interpret the information, there’s simply not enough information available. But the shares are probably close to worthless. ⁄@ Oz and M_Norway, thank you very much for expanding the info in the right direction and in depth. Your contribution and dedication to expose and point out these illegal criminal activities is greatly apprechiated. Keep up the awesome work! M_Norway: So the investors have basically lost more than 90% of the investments (93.75% – 96.25%), if I have interpreted it correctly? That didn’t come as a surprise. I misread the share price to ten times its worth. It was introduced at €0.012 (August 19), traded 1 time or so for €0.02 (August 27) (average transaction amount €27), and then it went dead. Someone has just TESTED that the shares really are tradeable through a stock exchange. The company itself (Global Digital Services Plc) looks completely empty. SiteTalk seems to have been sold to / merged with OPN The Opportunity Network. I also found “Ignite India” through their Facebook page, plus a network marketing company in Pakistan selling “Revolution Packages” (EVO Pack, REVO Pack, REVO Premium) in a price range from €165 to €1000. It’s also called “Evolution Global Convention” in some pictures (and was or is active in Austria). Dear All OPN/Sitetalk Members If you Want to pay 50Euro for Lydor market. Contact With me as soon as possible before company give deadline of this process because company will not wait for many months for us to complete the process.its our own responsibility. We would like to inform you that we have already completed the listing of the company in May 2013. We have not released the information to the field on the details of the company as yet, as we do not want to have the events in January repeat itself. We are now in the final stages of completing the information pack to the members and preparing the exchange for the information requests that they may receive once we release the information. We are also in the final stages of negotiations with a brokerage house to provide you with a seamless way of trading your shares. Thank you for your patience and we will shortly release the full details to the field. 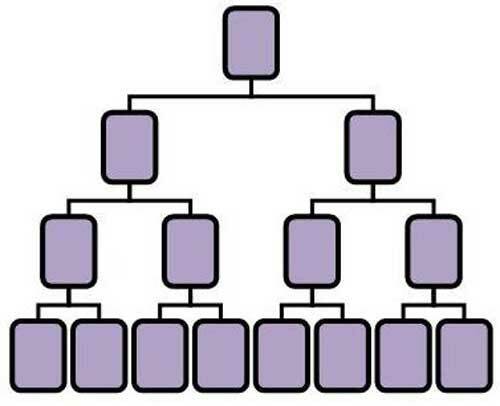 Rune Evensen, Jarle Thorsen, Kenny Nordlund and the others are not typical internet marketers, they are old fashioned pyramid scheme organizers. They prefer “Hallelujah meetings” rather than spam, and that’s also being reflected through the pictures. I found some other Facebook info about SiteTalk, shares, OPN, EVO and other stuff. If your organization, in the next few months (when the Evo packages offered) will make 20 packets Evo Premium will be in a weaker leg, it means that your organization will be increased by 2,000 people (20 * 100). Each of them, which will generate 1BV week (2000BV total score), even if they have not made any transactions. If you’re a Premium member, you’re guaranteed 200EUR week. (800EUR / month) for the next 2 years! The last part there sounded like a Ponzi scheme concept, but if the price of 1 packet is $1,000 then people will only get their money back, with a positive ROI of €800 on a €20,000 investment, over 2 years ( = 4% interest rate per 2 years). *CORRECTION* (It’s 60 EUR/BV per month; [15BV x 4 weeks]). A Member needs to personally accumulate a minimum of 15BV per week so as to be considered “Active” and therefore be qualified for any OPN bonus payments. If a Member fails to accumulate 15BV within a week, he still retains his position in the Network but will not get paid on any of the BVs accumulated after the qualification period has passed. A Member can pre-qualify and start accumulating BV again after achieving the “Active Status”. A Member can pre-qualify for up to 4 weeks in advance. The new qualification period will commence from the week of accumulating 15BV. A €35 annual fee will be due on the yearly anniversary date from when the Member activated their free OPN membership.